The Fancy Baby Grand Piano by Shoenhut comes in White, Black, Pink and Red. 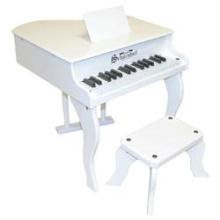 Give the gift of music so your little one can tickle the ivories and tap into a budding Mozart, Lady Gaga or Alicia Keys! A unique and beautiful gift available for $160.00 at a Target http://www.target.com/!